Sibghatullah_Mojaddedi - TerritorioScuola Enhanced Wiki Alfa - Enhanced Search with WikiPedia Using Robots to display related resources from the web to all WikiPedia words (Video/Audio, .doc, ,pdf, .ppt, maps, edu, .html). Sibghatullah Mojaddedi (Pashto: صبغت الله مجددی‎‎, 21 April 1925 – 11 February 2019) was an Afghan politician, who served as the President after the fall of Mohammad Najibullah's government in April 1992. He was also the founder of the Afghan National Liberation Front, and served as the chairman of the 2003 loya jirga that approved Afghanistan's new constitution. In 2005, he was appointed chairman of the Meshrano Jirga, upper house of the National Assembly of Afghanistan, and was reappointed as a member in 2011. He also served on the Afghan High Peace Council. Mojaddedi is considered to have been a moderate Muslim leader. Mojaddedi was born on 21 April 1925 in Kabul, Afghanistan. His family, the Mojaddedis, are a well-known family of religious scholars from Kabul who trace their ancestry to Mujaddid Ahmad Sirhindi, a prominent 16th-century Islamic scholar and Naqshbandi Sufi. Ethnically, the Mojaddedis are categorized as Pashtuns. Mojaddedi studied Islamic Law and Jurisprudence at al-Azhar University in Cairo, Egypt. In 1952 he returned to Afghanistan to teach in high schools and at Kabul University, where he became known as an advocate of Afghan independence. In 1959 Mojaddedi was accused of conspiring against then Soviet Prime Minister Nikita Khrushchev and was imprisoned until 1964. In 1973 he was forced into exile for his outspoken comments regarding Soviet influence in Afghanistan. Following the Saur Revolution in 1978, the new communist government killed Mojaddedi's brother and several of his relatives. His period in exile was spent in several countries such as Denmark and Pakistan before his entry into Afghan politics. During exile in Peshawar, Mojaddedi founded the Jebh-e-Nejat-e Melli (National Liberation Front) group. In 1988, he was elected head of the Afghan Interim Government, based in Peshawar. In April 1992, he was elected the chair of the Islamic Jihad Council that was set up to establish a post-Soviet Afghan government. He entered Kabul on 28 April amid a large crowd and assumed the new Islamic republic, and offered a general amnesty to all Afghans except the deposed President, Mohammad Najibullah, whose fate would be decided by "the public". His election was supported by all mujahideen guerilla factions except the Hezb-e Islami Gulbuddin, whose forces started firing rockets at the capital; violent clashes took place between them and soldiers of the new coalition near the Interior Ministry building. Mojadeddi pleaded with Gulbuddin Hekmatyar to lay down their arms, and commented "Mr. Hekmatyar was our brother. We were not expecting such an action. It is not allowed to him according to religion, according to Afghan tradition, to do this." During the period that Mojaddedi was President of Afghanistan, the Ariana plane carrying him to Kabul was hit by an RPG as it was landing at Kabul International Airport. The plane landed safely, with no fatalities. This position lasted for three months, although some sources say that he stayed in power for only two months. In May 1992, Burhanuddin Rabbani established a new leadership council, which undermined Mojaddedi's leadership, resulting in his resignation and handing over power to a new council. After the fall of the Taliban in 2001, Mojaddedi returned to Afghanistan from Pakistan and became chairman of the Loya Jirga, the assembly which approved Afghanistan's new constitution. In 2005 he became chairman of the Meshrano Jirga, Afghanistan's upper house of the National Assembly of Afghanistan, and he was reappointed as member in 2011. He also served on the Afghan High Peace Council. On 26 August 2015, Mojaddedi launched a new political party, the Council of Jihad and National Political Parties. Two suicide bombers carried out an attack in Kabul on 12 March 2006 against Mojaddedi, while he was a member of the upper house and head of a reconciliation committee aimed at engaging former Taliban members. The attackers blew up a vehicle filled with explosives next to his car as he was being driven through the streets. Four pedestrians were killed and Mojaddedi was slightly injured, with burns to his face and hands. Mojaddedi was erroneously reported to have died on 9 February 2016. He was subsequently reported to have been present at a ceremony commemorating the 27th anniversary of the Soviet withdrawal from Afghanistan on 15 February 2016. 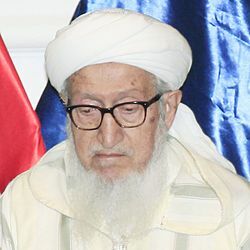 It was reported on 12 February 2019 that Mojaddedi had died. He was 93. ^ "سوانع مختصر پروفیسور حضرت صبغت الله مجددی ریس دولت اسلامی افغانستان / نگارنده شاآغا صدیق مجددی". [کابل] : انجمن فرهنگی ومطبوعاتی جبهه ملی نجات افغانستان، [1375؟]. 11 February 1979 – via Internet Archive. ^ a b "Former Afghan President Sibghatullah Mojaddedi dies". 11 February 2019. ^ Amstutz, Bruce (1994). Afghanistan: The First Five Years of Soviet Occupation. DIANE Publishing. p. 406. ISBN 0-7881-1111-6. Retrieved 20 July 2013. Born in 1925, he completed high school in Kabul and then went to Al-Azhar University in Cairo to earn bachelor's and master's degrees in Islamic law and jurisprudence. ^ a b c d e f Afghan Bios (14 April 2012). "Who is Who in Afghanistan: Mojadedi, Sibghatullah Hazrat Sahib Mujadidi Mojadidi". Retrieved 30 December 2012. ^ a b c d Safis Web (24 September 2006). "Profile: Sibghatullah Mojaddedi". Archived from the original on 6 June 2011. Retrieved 30 December 2012. ^ An Enemy We Created: The Myth of the Taliban-Al Qaeda Merger in Afghanistan. Google Books. p. 492. ^ Eide, Kai (2012). Power Struggle Over Afghanistan: An Inside Look at What Went Wrong-And What We Can Do to Repair the Damage. Skyhorse Publishing Inc. p. Chapter Three. ISBN 1-6160-8464-2. Retrieved 20 July 2013. Eighty-year-old Mojadeddi, a Pashtun, had been Karzai's mentor during the mujahideen times and was a deeply respected and moderate politician. ^ a b Gargan, Edward A. (29 April 1992). "Rebels' Leader Arrives in Kabul And Forms an Islamic Republic" – via NYTimes.com. ^ Harro Ranter (29 May 1992). "ASN Aircraft accident Tupolev 154M YA-TAP Kabul". ^ "Afghanistan: Blood-Stained Hands: III. The Battle for Kabul: April 1992-March 1993". ^ Kumar Sen, Ashish (28 September 2010). "Afghan 'peace council' draws fire". Washington Times. Retrieved 30 December 2012. ^ "Mojadedi announces the establishment of a new political council". 27 August 2015. ^ "Former Afghan President Survives Bomb, Blames Pakistan". RadioFreeEurope/RadioLiberty. ^ ""صبغت الله مجددی" رئیس جمهور اسبق افغانستان در گذشت". Aftab. 9 February 2016. ^ "Former Interim President Sibghatullah Mujaddedi Passes Away". TOLOnews. 12 February 2019. Retrieved 12 February 2019. Eur (2003). Far East and Australasia 2003. Routledge. ISBN 1-85743-133-2. Gladstone, Gary (2001). Afghanistan: History, Issues, Bibliography. Novinka Books. ISBN 1-56033-105-4. Human Rights Watch (April 2007). "The Human Cost The Consequences of Insurgent Attacks in Afghanistan". 19 (6c). Human Rights Watch. Runion, Meredith L. (2007). The History of Afghanistan. Greenwood Press. ISBN 978-0-313-33798-7. OCLC 237144347. Stedman, Stephen John; Tanner, Fred (2002). Refugee Manipulation: War, Politics, and the Abuse of Human Suffering. Brookings Institution Press. ISBN 0-8157-8090-7. OCLC 123336516. Wikimedia Commons has media related to Sibghatullah Mojaddedi.